Marchmont Community Centre, 62 Marchmont Street, London WC1N 1AB. To both its supporters and detractors, the Cuban Revolution is almost universally understood as having been won by a small band of guerrillas. This talk turns the conventional wisdom on its head, and argues that the Cuban working class played a much more decisive role in the Revolution’s outcome than previously understood. It contends that significant portions of the Cuban working class launched an underground movement in tandem with the guerrillas operating in the mountains. 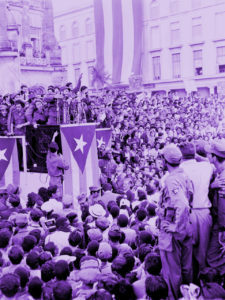 There was widespread working class militant activity, from illegal strikes and sabotage to armed conflict with the state, all of which culminated in two revolutionary workers’ congresses and the largest general strike in Cuban history. Cuban workers not only ensured the triumph of the Revolution, they went on to sustain it during its most difficult periods. Steve Cushion is a retired university lecturer living in East London. He is Branch Secretary of the University and College Union (UCU) London Retired Members’ Branch and is on the committees of the Socialist History Society and the Society for Caribbean Studies. He is also Secretary of Caribbean Labour Solidarity (CLS). He is author of The Hidden History of the Cuban Revolution: How the Working Class Shaped the Guerrillas’ Victory, Killing Communists in Havana: The Start of the Cold War in Latin America and Up Down Turn Around: The Political Economy of Slavery and the Socialist case for Reparations. He is joint author, with Dennis Bartholomew, of By Our Own Hands: A People’s History of the Grenadian Revolution. His current research is on German and Italian volunteers who fought in the French Resistance.